You can set the properties of your form and form inputs using the Form Editor dialog box. Use forms to build online forms used to process and/or store user input. You can set up simple or sophisticated two-way communication between visitors to your web page and available web services, including online ordering, joining email list subscriptions, performing searches of keywords, posting feedback, and many more. 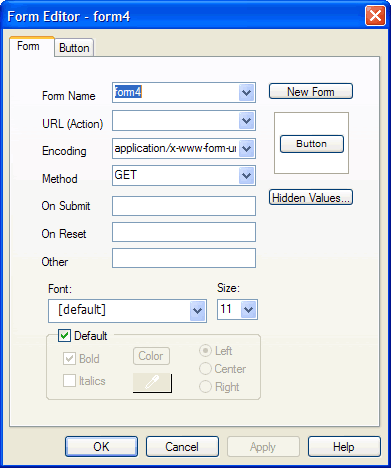 The Form Editor dialog box is unique in SiteSpinner® Pro in that along with the constant Form Tab, it contains an additional tab that differs depending on the selected form input. For example, if you open the Form Editor dialog box with a file upload form input selected, in addition to the Form Tab the File Upload Tab will be available. Use the Form Tab to set the properties of the form, and use the File Upload Tab to set the properties of the file upload input. Use the Form Editor dialog box to set form object and input field properties. With a form object selected, press Enter. With a form object selected, click the Edit Form button: in the Form Bar. With a form object selected, select Object>Forms>Edit Form Item. Right-click a form object and select Edit Form Item. The name of the Form Item tab changes dynamically depending on the currently selected input field. For example if a button input object is selected, the Form Item tab becomes the Button tab, if a file upload input object is selected, the Form Item tab becomes the File Browse tab, etc.